If you’re headed to the mountains this summer and are looking for some interesting history, stop in Georgetown — right off I-70 — and tour the Hotel de Paris. 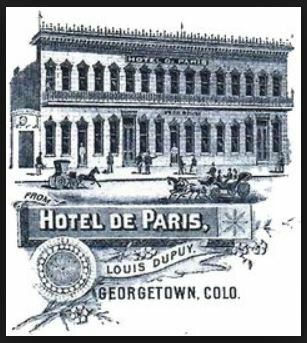 The hotel’s founder, Louis Dupuy, was born in France and arrived in Denver in 1869. He opened the hotel in 1875, and from that year until 1890 he made numerous expansions to the original building, which had started out as a bakery. It soon became one of the most popular and elegant hotels in the Rocky Mountains. Dupuy passed away in 1900, and new owners kept the establishment running as a boarding house until 1939. In 1954 the Society of Colonial Dames purchased the hotel and turned it into a museum. In 1978 it was returned to a more accurate representation of the Dupuy era, and since then has been giving visitors a look back into life in a late-nineteenth-century mining town. Hotel de Paris is also Colorado’s only National Trust for Historic Preservation site. The museum’s collection includes several thousand objects original to the hotel. To commemorate the hotel’s rich history and its purchase by the Colonial Dames, the Colorado Historical Society in 1954 published a book on Hotel de Paris. Hotel de Paris and Louis Dupuy in Georgetown, Colorado: A Fragment of Old France Widely Known Everywhere in the West provides a quick history for visitors, useful either before or after a visit to the hotel. You can find resources on other Georgetown attractions, such as the Georgetown Loop Railroad and the Hamill House, by searching our library’s web catalog. Next Happy 140th Birthday Colorado!